The South Beach Wine & Food Festival was hit by a Tiki tornado on Friday night, when more than 700 people packed the Shore Club’s poolside patios for a whirlwind event hosted by celebrity chef Emeril Lagasse. Seven of the country’s top mixologists competed in “The Art of Tiki: A Cocktail Showdown,” bringing a true taste of the tropics to South Beach. Brian Miller and his Pain Reliever. 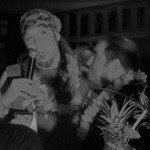 When the smoke cleared, the winner of the Judge’s Choice award (and a $5,000 check) was veteran New York City bartender Brian Miller, host of the popular Tiki Mondays With Miller events. 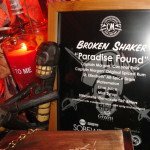 The People’s Choice award went to a local favorite, Miami Beach craft cocktail bar The Broken Shaker. Bartenders Randy Perez and Gui Jaroschy accepted the $2,000 prize after spending several hours feverishly mixing drinks for the South Beach masses. 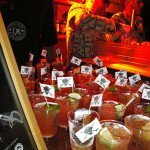 Other bars and mixologists competing were The Mai-Kai (Fort Lauderdale), Frankie’s Tiki Room (Las Vegas), Royal Kona Resort (Hawaii), The Rum Line (Miami Beach), and Sunny’s (Miami). Lagasse was joined by an esteemed crew of VIP judges: Author and bar owner Jeff “Beachbum” Berry (Latitude 29, New Orleans), bar owner and rum expert Martin Cate (Smuggler’s Cove, San Francisco), plus rum ambassador and consultant Lynnette Marrero (Diageo; DrinksAt6, New York City). There were also food stations scattered around the Shore Club’s two pools featuring notable chefs from South Florida and beyond. After winning his top prize and posing for photos, Miller said he hoped to use the money to help fund an upcoming move to Los Angeles. Miller said he wanted to “take a seat at the big boys’ table” and “hopefully pick up where Don (the Beachcomber) left off.” However, less than a month later, Miller said via e-mail that he scuttled those plans and will be staying in New York. 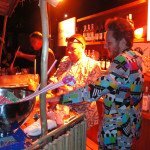 Judges Martin Cate (left) and Beachbum Berry enjoy The Mai-Kai’s Molokai Swizzle. The event ran smoothly despite an unusually cold and blustery night at the beachside Shore Club. A light drizzle sporadically appeared near the end of the three-hour party, but it was not enough to dampen any spirits. Kudos to the festival and hotel staff, who kept things running smoothly all night. Attention was paid to many details, including having such a large and attentive staff on hand that you had to be careful that your drink wasn’t snatched up if you left it unattended for a few seconds. The one logistical snag, in my mind, was the layout of the bar stations, which formed a “U” shape around the main pool. Because the judges were set up in a blocked-off private area at the top of the U, guests who reached the last kiosk were confronted with a dead end. This created gridlock and some crowd issues at that end of the pool. Having the path continue around the pool in a circle would have made the flow much better. Also, someone needs to explain to those in charge that when you create an immersive Tiki experience, electronic dance music is totally inappropriate. I know this is South Beach, but give us a break with the annoying club music. There’s a wide array of tropical-themed genres that would have worked wonderfully in the DJ’s playlist. Or better yet, book a live band or small combo (where were you, Gold Dust Lounge?). But that was not enough to take away from our enjoyment, thanks to the top-notch cocktails and small bites. Was it worth the $95 price tag? That’s probably a matter of personal expectations. It wasn’t difficult to grab the sample cocktails and go back for seconds or thirds of your favorites. But I was so busy sampling the drinks and chatting, I ran out of time to hit more than half of the food booths before they stopped serving. More time and more food would have been nice. Randy Perez (left) and Gui Jaroschy from The Broken Shaker in Miami took home the People’s Choice award. Of those I tried, I was impressed by all the chefs. I savored the rich salt-baked American red snapper from Eric Grutka of Ian’s Tropical Grill in Stuart. The one-bite servings were doled out in spoons, the perfect way to nosh when you’re also juggling cocktails. The pork tacos from Scott Linquist of Miami’s Coyo Taco were delicious, though the corn tortilla was a bit difficult to handle with one hand. But the bite of the night was the decadent sliders from Steve Rhee, chef at the Shore Club’s Terrazza restaurant. 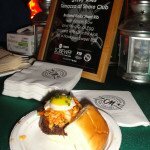 [See photo] A Hawaiian sweet roll was filled with braised kalbi short rib with kimchi slaw and a fried quail egg, topped with cilantro aioli. This is an instant Tiki bar classic. But my main order of business was to sample all of the competing cocktails and give them an unbiased but critical rating. Maybe I’d agree with the judges and the “people’s choice” votes, maybe not. Before I got started, I ran into one of the judges, Martin Cate, who let me know that the number of contestants had dropped from eight to seven. 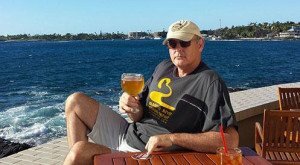 Unfortunately, Paul McGee could not get away from his booming new bar in Chicago (Lost Lake). This eliminated one of the top contenders, IMHO. But Cate noted that it also removed his conflict of interest since he runs the Lost Lake rum program. Emeril’s Tchoup Chop had a booth (featuring a tasty Piña Colada Mojito) but was not part of the competition for obvious reasons. Now, on with the cocktail adventure: We arrived at 10 p.m. from blustery Collins Avenue, through a portal and into a tropical cocktail oasis on South Beach. Booths and drinks are listed in order as we wound our way clockwise around the pool, which was awash with the projected logo of sponsor Captain Morgan rum. First, a quick recap of the rules: Mixologists had to use rums provided by Diageo, owner of the Captain Morgan brand. Their cocktails could contain no more than seven ingredients, including their own unique infusions or flavors. Recipes were approved in advance, and ingredient lists were posted at each booth. The judges were given some general guidelines by organizer Francesco Lafranconi, executive director of mixology and spirits educator for Southern Wine and Spirits of Nevada. 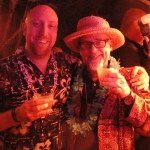 He was quoted as saying the best cocktails should showcase the “holy trinity” of Tiki drinks: Rum, fresh exotic flavors (such as tropical fruits), and spice (cinnamon, nutmeg, anise, allspice, etc.). 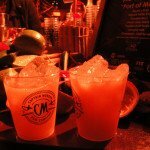 The bartenders prepared full-sized drinks in special mugs and glasses with elaborate garnish for the judges. In addition to the winner, the panel also named a runner-up and third-place finisher. Guests had a much more simple task: We were each given a sand dollar to place in a treasure chest at our favorite drink’s station. I went one step further, rating each cocktail on a 10-point scale. My criteria include not only those the judges pondered, but also such things as balance, creativity and use of ingredients. Also, I didn’t consider presentation as much as the judges did since I didn’t see the full-blown mugs and garnishes that they did. 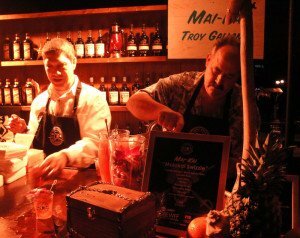 The Mai-Kai’s Kern Mattei and Troy Gallant are busy preparing the Molokai Swizzle. P Moss (left) from Frankie’s Tiki Room in Las Vegas and Randy Perez from The Broken Shaker in Miami in the heat of the battle. Brian Miller (Tiki Mondays With Miller, New York City) shows off his check for winning the Judge’s Choice award. The results: With The Mai-Kai and The Broken Shaker in a virtual tie, I went with the sentimental favorite and dropped my sand dollar in the Molokai Swizzle’s treasure chest. The classic nature of the drink gave it an ever-so-slight edge over the unique and creative Paradise Found. Brian Miller’s Pain Reliever was close behind in third place, just a half-point below the others. The rest of the field had its moments, but none stood out for me like the top three did. Pulse blend at high speed for 5-8 seconds. Pour into a double old-fashioned glass or Tiki mug. Top with more crushed ice. Garnish with a pineapple spear and fresh orchid if available. This is The Atomic Grog’s take on the cocktail served on Friday, Feb. 20, during The Art of Tiki: A Cocktail Showdown at the South Beach Wine & Food Festival. While The Mai-Kai typically doesn’t mix with either of these rums, the combination works well. Ron Zacapa brings sophistication and depth, while Captain Morgan Black adds richness and spice. The other elements are signature Mai-Kai ingredients. The Angostura-Pernod combo was a secret weapon Don the Beachcomber used in many classics. 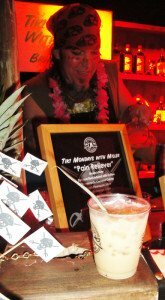 And If you’ve made any of the many Mai-Kai recipes on The Atomic Grog, you’ll know that the honey mix and passion fruit syrup are extra rich to give the drinks additional body and sweetness. Combine 2 parts honey to 1 part water and mix well. Passion fruit syrup can be made by heating rich simple syrup (2 parts sugar to 1 part water) with frozen passion fruit puree. Fine bottled versions include Fee Brothers, B.G. Reynolds, Monin, and Aunty Lilikoi. 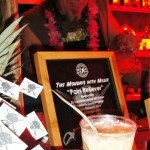 Brian Miller (left) and Cabell Tomlinson (Tiki Mondays With Miller, New York City) mix up the Pain Reliever. Spike Mendelsohn (right) and his Sunny’s crew prepare their Haole Punch. All the way from Hawaii, Royal Kona Resort presented the Don’s Gal Ginger cocktail. 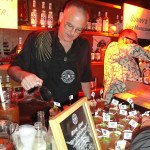 Jeff Isbister of Royal Kona Resort prepares Don’s Gal Ginger cocktails. A short rib slider from chef Steve Rhee of the Shore Club’s Terrazza restaurant in Miami Beach. The Broken Shaker’s drink gets high marks for creativity. 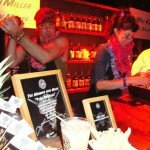 Gui Jaroschy of The Broken Shaker (right) and P Moss from Frankie’s Tiki Room prepare cocktails as Captain Morgan looms overhead. 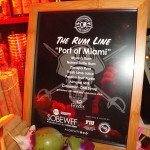 At The Rum Line booth, Port of Miami cocktails are quickly poured. The Rum Line cocktail recipe. Port of Miami cocktails from The Rum Line, a new bar at the Loews Miami Beach Hotel. 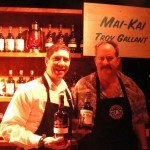 The Mai-Kai in Fort Lauderdale was represented by manager Kern Mattei (left) and mixologist Troy Gallant. It’s time for Tiki cocktails and the ever-growing culture that surrounds the movement to get a chance to shine. And there’s no better place for a moment in the sun during February than the South Beach Wine & Food Festival, and an event hosted by celebrity chef Emeril Lagasse. 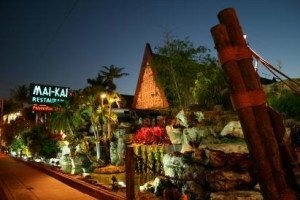 The Art of Tiki: A Cocktail Showdown is set for Friday night (Feb. 20) from 10 p.m. to 1 a.m. at the Shore Club. The event’s organizer, mixologist Francesco Lafranconi of Southern Wine and Spirits of Nevada, promises an evening of “Polynesian flare with Tiki-inspired cocktails from across the country.” Judging by the all-star cast of bartenders, mixologists, chefs and other VIPs, this event will definitely deliver. Don’t look for tickets: It’s sold out, like many of the massively popular South Beach Wine & Food Festival’s star-studded events, which include such hospitality industry notables as Rachael Ray, Giada De Laurentiis, Bobby Flay, and Geoffrey Zakarian (Food Network is a title sponsor). There are more than 50 special events scheduled for today through Sunday all over Miami and South Florida. But we’re most excited about Friday night’s poolside party at the Shore Club, a boutique oceanside resort hotel on Collins Avenue. 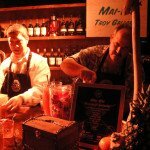 Recognizing the “subculture enjoying a resurgence in popularity with bartenders across America,” Lafranconi and SoBeWFF (as the festival is known) have assembled some of the top names in Tiki for the showdown, sponsored by Captain Morgan Rum. Scheduled to compete are: Lost Lake (Chicago), The Mai-Kai (Fort Lauderdale), Tiki Mondays With Miller (New York City), Frankie’s Tiki Room (Las Vegas), Royal Kona Resort (Hawaii), The Rum Line (Miami Beach), The Broken Shaker (Miami Beach), and Spike Mendelsohn’s upcoming Miami restaurant. Joining Lagasse at the judge’s table are Jeff “Beachbum” Berry (Latitude 29, New Orleans), Martin Cate (Smuggler’s Cove, San Francisco), and Lynnette Marrero (Diageo rum ambassador; DrinksAt6, New York City). Guests will also pick a winner. Two awards will be given: Judge’s Choice ($5,000) and People’s Choice ($2,000). The Shore Club’s pool area will be surrounded Tiki bars manned by the mixologists, plus food stations featuring some top chefs from South Florida and elsewhere. The “light Polynesian-inspired bites” will be served by Steve Rhee from Terrazza at the Shore Club, John Latrellis from Lure Fishbar (Miami), Eric Grutka from Ian’s Tropical Grill (Stuart, Fla.), Scott Linquist from Coyo Taco (Miami), Franklin Becker from That Little Beet (New York City), and Herb Wilson from Red Ginger (Miami). 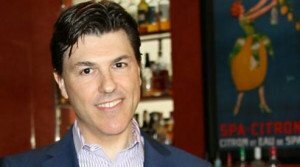 * Francesco Lafranconi, executive director of mixology and spirits educator for Southern Wine and Spirits of Nevada, is one of the world’s premiere mixologists and producer of seminars and live events. He gained fame by leading some of the world’s top hotel bars, from Scotland to Germany to Italy. He also has won many of the world’s most prestigious cocktail competitions, and founded the Academy of Spirits and Fine Service education program. 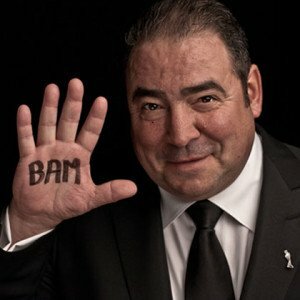 * Emeril Lagasse, one of the world’s most trusted and respected food television personalities, is the chef/proprietor of 13 restaurants and author of 18 cookbooks. He has hosted more than 2,000 shows on the Food Network and is the food correspondent for ABC’s Good Morning America. His newest show, Emeril’s Florida on the Cooking Channel, takes viewers on a tour of some of the Sunshine State’s most creative independent restaurants. Lagasse has always had a soft spot for Tiki, featuring authentic tropical drink recipes on the menus of his restaurants. (2013). 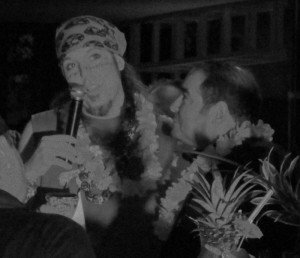 In the fall, he opened his first Tiki bar and restaurant, Latitude 29 in New Orleans. * Martin Cate is the creator of Smuggler’s Cove in San Francisco, consistently named one of the top bars in the world. This rum and tropical drink expert is often tapped to present seminars, judge competitions and consult with top brands and companies. He’s working on his first book, due in the fall. * Lynnette Marrero is rum ambassador for Diageo, one of the world’s top spirits companies. 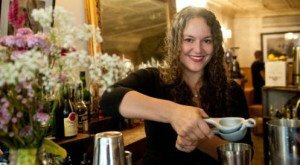 She worked her way up through the ranks as a bartender in some of New York City’s most acclaimed cocktail bars before moving on to consulting and creating bar programs in Manhattan with her company, DrinksAt6. 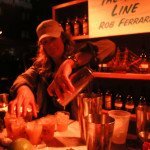 In 2011, she co-created and produced Speed Rack, an international cocktail competition for women bartenders that raises money for breast cancer related charities. 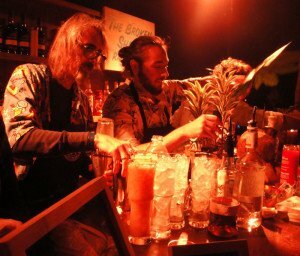 * Lost Lake (Chicago): The brainchild of longtime bartender and creative force Paul McGee, Lost Lake is the newest Tiki bar in the growing Windy City cocktail scene. McGee spent some 20 years behind the stick in Houston and Las Vegas before moving to Chicago and making a name for himself in 2008 at The Whistler. In 2013, he created the award-winning Tiki bar Three Dots and a Dash before joining a new hospitality group and opening Lost Lake in late 2014. * The Mai-Kai (Fort Lauderdale): This venerable 58-year-old Polynesian restaurant, recently named to the National Register of Historic Places, is a direct descendant of the Don the Beachcomber chain that began in Hollywood, Calif., in the 1930s when restaurateur Donn Beach opened what is considered the world’s first Tiki bar and lounge. Still family owned and operated, the bar continues to follow the original, secret drink recipes that date back to Tiki’s early days. 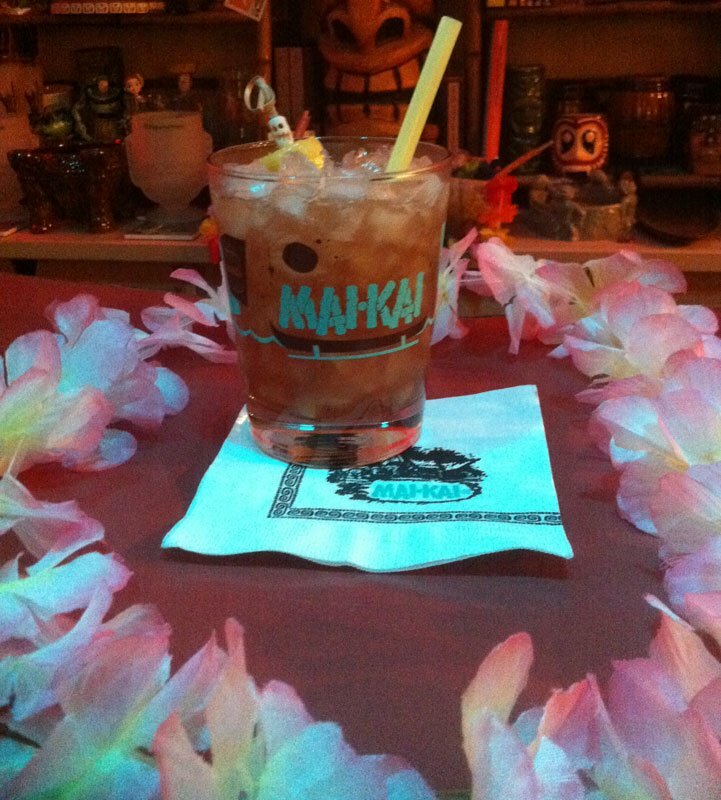 The Mai-Kai will be represented in the showdown by head mixologist Troy Gallant. 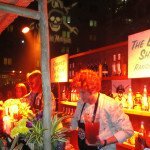 * Tiki Mondays With Miller (New York City): Mixologist Brian Miller evokes the history of rum with his pirate persona and potent cocktails. This veteran bartender has worked at some of the Big Apple’s top craft cocktail bars and also runs his own consulting company. 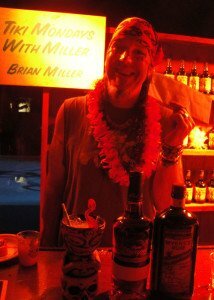 Since 2011, he has hosted regular pop-up events at bars across the city under the Tiki Mondays With Miller banner. The winner of numerous cocktail competitions, Miller was also tapped by Diageo in 2011 to be Tanqueray’s first New York City brand ambassador. 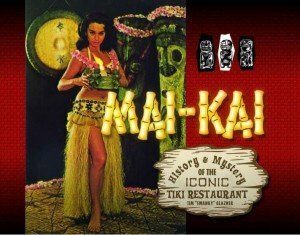 , featuring their most popular recipes and celebrating the history of Tiki in Las Vegas. * Royal Kona Resort (Hawaii): Located in Kailua-Kona on the Big Island of Hawaii, this true tropical paradise is home to the Don the Beachcomber Restaurant and Don’s Mai Tai Bar. Named in honor of the godfather of tropical mixology, the venues are overseen by director of food and beverage Jeff Isbister. 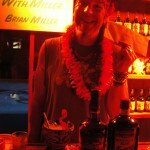 The veteran bartender and manager creates specialty cocktails for his bar menus and also helps run the annual Don the Beachcomber’s Mai Tai Festival at the resort. * The Rum Line (Miami Beach): A new concept in the Lure Fishbar at the Loews Miami Beach Hotel, The Rum Line is a welcome addition to the South Florida cocktail scene with its extensive collection of cane spirits and quality cocktail program. 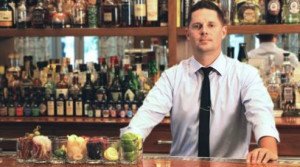 Bar manager Rob Ferrara, named best bartender in Miami by New Times, has developed other top bar programs before helping create The Rum Line. 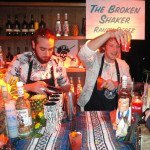 * The Broken Shaker (Miami Beach): This small and crafty Miami bar has quickly established a reputation as one of the top cocktail bars in the United States. 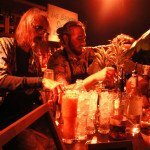 Located in the Freehand Hostel in funky South Beach, the bar and its bartenders are known for pushing the envelope and creating unique flavor combinations. Mixologist Randy Perez will be competing in the showdown. * Spike Mendelsohn: This acclaimed chef is the wild card in the competition. He’s appeared on TV’s Top Chef and Next Iron Chef, but his experience in the Tiki cocktail world is not well established. He operates several restaurant concepts in Washington, D.C., and across the Northeast, and he’ll soon be opening a new Miami restaurant. The rules: Cocktails must contain no more than seven ingredients, including rum and spirits provided by Diageo, owner of the Captain Morgan brand. Mixologists can provide their own unique ingredients and prep them in advance. Drink recipes were also submitted and approved in advance. SoBeWFF, now in its 14th year, has grown into one of the largest food and wine festivals in the world, attracting more than 50,000 guests a year. The festival’s main event is hosted by Guy Fieri and features a live performance by Blues Traveler. But some of the coolest events are the smaller, more intimate dinners and tastings. SoBeWFF is organized by Lee Schrager, a vice president for Southern Wine & Spirits. The South Florida-based liquor distributor runs the festival, which benefits Florida International University’s hospitality and tourism school. It has raised about $20 million to date. 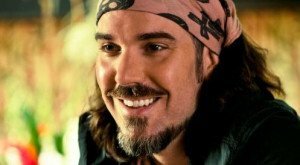 Berry, Cate, McGee and Miller will be mixing up their signature drinks during a special event, the Tiki Tower Takever, on Thursday, June 11, at The Hukilau in Fort Lauderdale. Click here for tickets and more info. This entry was posted in Cocktails, Events, Festivals, Food, Rum, South Florida and tagged Beachbum Berry, Brian Miller, Broken Shaker, Captain Morgan, Don The Beachcomber, Emeril Lagasse, Francesco Lafranconi, Frankie’s Tiki Room, Lost Lake, Lynnette Marrero, Mai-Kai, Martin Cate, Paul McGee, Ron Zacapa, Royal Kona Resort, Shore Club, SoBeWFF, South Beach Wine & Food Festival, Spike Mendelsohn, The Rum Line. Bookmark the permalink.